According to the 1962 Missal of St. John XXIII the Extraordinary Form of the Roman Rite, today is the feast of Sts. Cyril and Methodius. Their memorial in the Ordinary Form of the Roman Rite is celebrated on March 7. 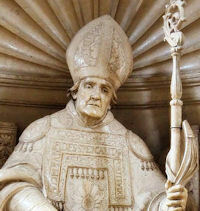 Today is also the historical feast of St. Willibald and St. Pantaenus, Father of the Church, (+ c. 216). St. Willibard was son of the holy king St. Richard, and was born about the year 704 in the kingdom of the West-Saxons, about the place where Southampton now stands. When he was three years old his life was despaired of in a violent sickness; but when all natural remedies proved unsuccessful, his parents carried him and laid him at the foot of a great cross which was erected in a public place near their house, according to the custom in Catholic countries to this day. There they poured forth their prayers with great fervor, and made a promise to God that in case the child recovered they would consecrate him to the divine service. God accepted their pious offering, and the child was immediately restored to his health. St. Richard kept the child two years longer at home, but only regarded him as a sacred depositum committed to him by God; and when he was five years old placed him under the Abbot Egbald, and other holy tutors in the monastery of Waltheim. The young saint, from the first use of his reason, in all his thoughts and actions seemed to aspire only to heaven, and his heart seemed full only of God and his holy love. He left this monastery about the year 721, when he was seventeen years old, and his brother Winibald nineteen, to accompany his father and brother in a pilgrimage of devotion to the tombs of the apostles at Rome, and to the Holy Land. They visited many churches in France on their road; but St. Richard died at Lucca, where his relics are still venerated in the church of St. Fridian, and he is commemorated in the Roman Martyrology on the 7th of February. The two sons went on to Rome, and there took the monastic habit. About two years after this, Winibald having been obliged to return to England, St. Willibald, with two or three young Englishmen, set out to visit the holy places which Christ had sanctified by his sacred presence on earth. They added most severe mortifications to the incredible fatigues of their journey, living only on bread and water, and at land using no other bed than the bare ground. They sailed first to Cyprus and thence into Syria. At Emesa St. Willibald was taken by the Saracens for a spy, was loaded with irons, and suffered much in severe confinement for several months, till certain persons, who were charmed with his wonderful virtue, and moved with compassion for his disaster, satisfied the caliph of his innocence, and procured his enlargement. The holy pilgrims expressed their gratitude to their benefactors, and pursued their journey to the holy places. They resolved in visiting them to follow our Divine Redeemer in the course of his mortal life; and therefore they began their devotions at Nazareth. Our saint passed there some days with his companions in the continual contemplation of the infinite mercies of God in the great mystery of the incarnation; and the sight of the place in which it was wrought drew from his eyes streams of devout tears during all the time of his stay in that town. From Nazareth he went to Bethlehem, and thence into Egypt, making no account of the fatigues and hardships of his journey, and assiduously meditating on what our Blessed Redeemer had suffered in the same. He returned to Nazareth, and thence traveled to Cana, Capharnaum, and Jerusalem. In this last place he made a long stay to satisfy his fervor in adoring Christ in the places where he wrought so many great mysteries, particularly on the mountains of Calvary and Olivet, the theaters of his sacred death and ascension. He likewise visited all the famous monasteries, lauras, and hermitages in that country, with an ardent desire of learning and imitating all the most perfect practices of virtue, and whatever might seem most conducive to the sanctification of his soul. The tender and lively sentiments of devotion with which his fervent contemplation on the holy mysteries of our redemption inspired him at the sight of all those sacred places, filled his devout soul with heavenly consolations, and made on it strong and lasting impressions. In his return a severe sickness at Acon exercised his patience and resignation. After seven years employed in this pilgrimage he arrived safe with his companions in Italy. The celebrated monastery of Mount Cassino having been lately repaired by Pope Gregory II., the saint chose that house for his residence, and his fervent example contributed very much to settle in it the primitive spirit of its holy institute during the ten years that he lived there. He was first appointed sacristan, afterwards dean or superior over ten monks, and during the last eight years porter, which was an office of great trust and importance, and required a rooted habit of virtue which might suffer no abatement by external employs and frequent commerce with seculars. It happened that in 738 St. Boniface, coming to Rome, begged of Pope Gregory III. that Willibald, who was his cousin, might be sent to assist him in his missions in Germany. The pope desired to see the monk, and was much delighted with the history of his travels, and edified with his virtue. In the close of their conversation, he acquainted him of Bishop Boniface’s request. Willibald desired to go back at least to obtain the leave and blessing of his abbot; but the pope told him his order sufficed, and commanded him to go without more ado into Germany. The saint replied that he was ready to go wheresoever his holiness should think fit. Accordingly he set out for Thuringia, where St. Boniface then was, by whom he was ordained priest. His labors in the country about Aichstadt, in Franconia and Bavaria, were crowned with incredible success, and he was no less powerful in words than in works. In 746 he was consecrated by St. Boniface bishop of Aichstadt. This dignity gave his humility much to suffer, but it exceedingly excited his zeal. The cultivation of so rough a vineyard was a laborious and painful task; but his heroic patience and invincible meekness overcame all difficulties. His charity was most tender and compassionate, and he had a singular talent in comforting the afflicted. He founded a monastery which resembled in discipline that of Mount Cassino, to which he often retired. But his love of solitude diminished not his pastoral solicitude for his flock. He was attentive to all their spiritual necessities, he visited often every part of his charge, and instructed all his people with indefatigable zeal and charity. His fasts were most austere, nor did he allow himself any indulgence in them or in his labors on account of his great age, till his strength was entirely exhausted. Having labored almost forty-five years in regulating and sanctifying his diocese, he died at Aichstadt on the 7th of June, 790, being eighty-seven years old. He was honored with miracles, and buried in his own cathedral. Pope Leo VII. canonized him in 938. In 1270 the Bishop Hildebrand built a church in his honor, into which his relics were translated, and are honorably preserved to this day; but a portion is honored at Furnec in Flanders. See the three lives of St. Willibald, written by contemporary authors, especially that by a nun of his sister St. Walburga’s monastery. She gives from the saint’s own relation a curious and useful description of the Holy Land, as it stood in that age; which is rendered more curious by the notes of Mabillon, and those of Basnage in his edition of Canisius’s Lect. Antiquae. Rev. Alban Butler (1711-73). Volume VII: July. This learned father and apostolic man flourished in the second century. He was by birth a Sicilian, by profession a Stoic philosopher. His esteem for virtue led him into an acquaintance with the Christians, and being charmed with the innocence and sanctity of their conversation, he opened his eyes to the truth. He studied the Holy Scriptures under the disciples of the apostles, and his thirst after sacred learning brought him to Alexandria, in Egypt, where the disciples of St. Mark had instituted a school of the Christian doctrine. The Indians who traded at Alexandria entreated him to pay their country a visit, whereupon he forsook his school and went to preach the Gospel to the Eastern nations. St. Pantænus found some seeds of the faith already sown in the Indies, and a book of the Gospel of St. Matthew in Hebrew, which St. Bartholomew had carried thither. He brought it back with him to Alexandria, whither he returned after he had zealously employed some years in instructing the Indians in the faith. St. Pantænus continued to teach in private till about the year 216, when he closed a noble and excellent life by a happy death.